Waking up to to violence in our communities is like being served burnt toast for breakfast. When malicious behavior mars our heavenly slice of life, we too become burned, crusty, and our hearts blackened by the devastating acts of those around us. While we try and scrape off the darkened edges of society, we still end up having to ingest the charred remnants of violent, criminal actions. And, that doesn’t settle well in the peaceful belly of humanity. The adage ‘like creates like,’ holds true in every situation. What happens to you when you see someone yawn? You yawn, too. What happens to you when someone breaks out into uncontrollable laughter? You laugh, too. Now, what happens when your neighborhood has been ravished by anger and violence? You get angry, too. Unfortunately, violence is a common occurrence in our human experience. It is much like fire. The more fuel we give it, the more it will burn. While it is healthy and productive to process our emotions, going beyond what heals is not helpful. Dr. Martin Luther King Jr. believed returning violence for violence multiplies violence, and that darkens cannot drive out darkness, because only love can drive out hate. Of course, choking on a piece of burnt toast isn’t our idea of love, but spitting it out at someone in anger is not the answer. This meditation is designed to dampen the flames of violence, and promote peace in the world. Begin in a comfortable position, free from distraction. If you have just witnessed images of violence on the news, or in person, become aware of how your body feels. Bring your attention to someone who you would like to hurt because of some filthy, violent act they’ve senselessly committed. Notice the stress and tension arise in your body as you think of this person. Imagine these feelings like a fire blackening your soul. Visualize the flames burning your heart, and charring your spirit. Sit with these uncomfortable feelings for several deep breaths. Now, bring your attention to someone you love dearly. When you think of this person, notice the feeling of peace and contentment in your heart and soul. Feel that love and connection beginning to put out the angry inferno in your soul. Now, notice the different sensations between hating someone and loving someone. What feels best in your body? Embrace love within every cell of your being. Fully embody the notion that love is much softer, sweeter, and way more powerful than violence. 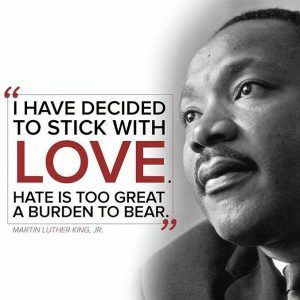 Just as MLK Jr. also said, “By its very nature, hate destroys and tears down; by its very nature, love creates and builds up,” we must put our energy toward loving vs hating. Let us all practice this meditation every day, and may we no longer choke on burnt toast, but instead be free to break bread with all, and celebrate peace in the bountiful banquet of life.